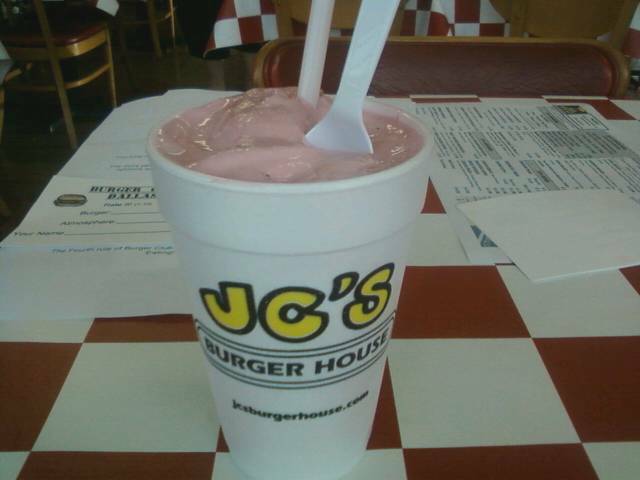 So for the third Burger Club Dallas outing I headed over to JC's Burger House in Plano. JC's is a local franchised establishment, with the Plano store at 15th and Independence being the original, founded in 1999. Well, elven years and several awards later they are still making great burgers! I arrived a little early and was greeted by a very warm and friendly staff. The small restaurant was very clean and well kept, pretty empty for a Saturday night, but that would change soon. I got a drink and waited to place my order, I chatted with a lovely and very helpful young lady named Gabrielle, one of the host/ managers, for a few minutes about the restaurant and menu. I was pleased to hear that they grind their own meat fresh daily, and they have fresh cut fries, and blue bell ice cream shakes! After talking with some of the other patrons and telling them about Burger Club Dallas, I placed my order with Gabrielle. I ordered the half pounder with bacon and cheddar ( they also offer swiss, american, and pepper jack), a side of fires and a strawberry shake. 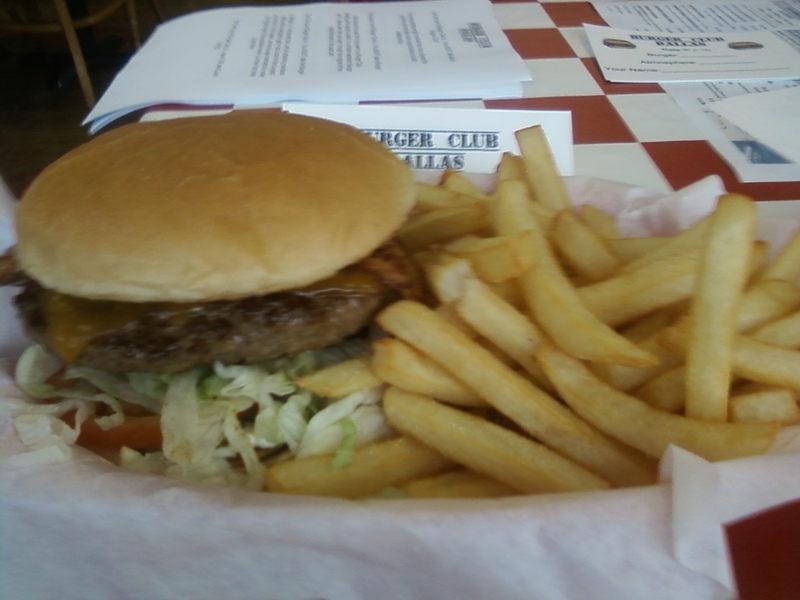 After about fifteen minutes and a great chat with the new owner and a really nice guy, Bill Oglesby, I recieved the following burger! Wow, so this not only smelled amazing, it looked great too! Contrary to what some people may say, presentation is important, we eat with our eyes. So, I bite into a hot fresh burger with a lightly toasted bun. The meat was cooked to order ( medium) the patty had great flavor and was very juicy, there was some crust, not quite enough for me. The Cheese was melted perfectly and the bacon was thin and crisp, no soggy pork products here. I was so busy shoving this meaty bliss into my mouth that I almost didn't take enough time to evaluate it. It was wonderful and classic, the fries were crisp and well made also. I gave this burger a 9/10, great flavor and very fresh, this place puts Moo Ya and Five Guys to shame in my opinion. The only critiques I had were, the crust on the patty, and the bun not being toasted enough to hold up to the half pounder. They use shredded lettuce on their burgers and chopped red onion, I prefer whole leaf and whole onion, but that is not a big deal because the ingredients were so fresh! What was really great to me as well was the staff, they knew most of the people coming in by name, and they have so many regulars that come in. One couple I met eats there every Saturday night, and all of the scores I got back from people were high! The Burger Club tally came out to a 9.2 for the burger and 8.5 for the establishment. If you have not tried this place get over there and meet the amazing staff, and tell them I said hi! Great job JC's keep it up, you guys are running a close second to Twisted Root in Deep Ellum in my book as best Burger in DFW so far! Bonus Pic of my super thick and delicious shake! Great review. I'll get over there soon and try something different. That shake looks tasty! Thanks for the comment Dace! Yeah good stuff for sure, looking forward to Maple and Motor and Snookies!